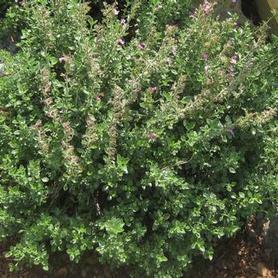 Germander is an evergreen shrub-like plant with small shiny green scalloped leaves. It flowers in mid to late summer with short spikes of rosy purple which are attractive to insects. Teucrium chamaedrys can be made into a short hedge in a formal garden setting because it takes trimming very well. Prefers a dry site. 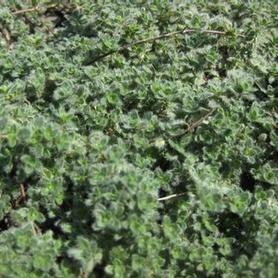 Woolly Thyme has tiny grayish green leaves that look like they're covered with soft silky fur. Insignificant pink flowers are of use to honeybees, but the mat-forming foliage is what makes it good for paths and rock gardens. Needs a sunny well-drained site. 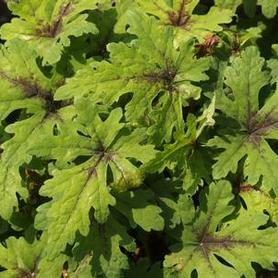 'Brandywine' Foamflower has beautiful light green leaves with distinct red center blotches. The flowers are lovely white spires held above the ground-hugging foliage, and they persist for up to 8 weeks in April and May. Tiarella cordifolia 'Brandywine' sends out short runners in both spring and fall, so it makes a good shade groundcover. 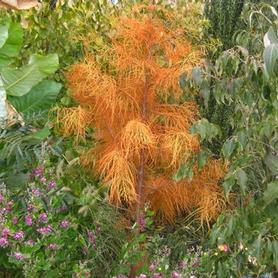 The fall and winter color is an attractive bronze. Sinclair Adams of Dunvegan Nursery introduced this native beauty as a part of his Pennsylvania River Series. 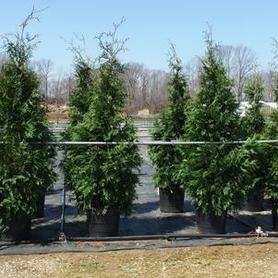 PRN Preferred: An excellent dry shade groundcover, with wonderful flowers and foliage. 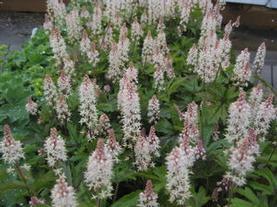 'Running Tapestry' Foamflower has white flowers in spring over bronze speckled green foliage. 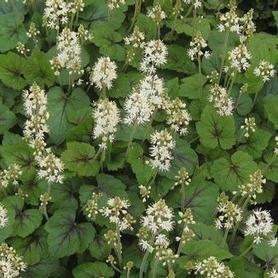 Tiarella cordifolia 'Running Tapestry' is a running form and makes an excellent woodland groundcover. A Jim Plyler (Mr. 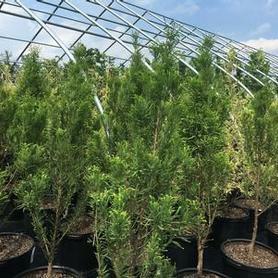 Native Plant) find in PA. The pinkish white flowers of 'Candy Striper' Foamflower appear over deeply incised green leaves with dark maroon stripes down the center of each lobe. 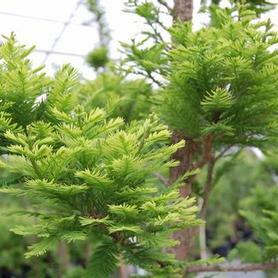 The foliage is just as showy as the flower and the bloom period extends from late April through May. ‘Crow Feather’ Foamflower produces lots of white fluffy flower spikes in late spring and early summer. 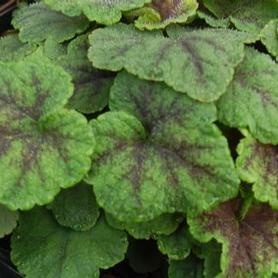 They are displayed over attractive green deeply incised leaves which have dark purple feathery veining. 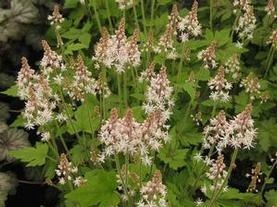 Tiarella x ‘Crow Feather’ is a clump form Foamflower with good reblooming qualities. 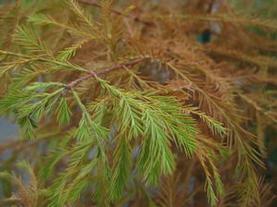 PRN Preferred: Foliage is a particularly showy combination of colors and form. The white flowers of 'Jeepers Creepers' Foamflower are produced for a long time in spring and summer, and it has blackish purple markings on shiny lobed green foliage. Tiarella x 'Jeepers Creepers' is a creeping form. 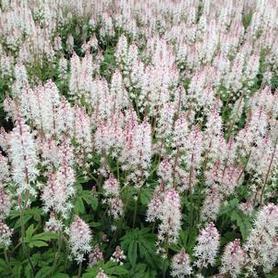 'Pink Skyrocket' Foamflower has pink flowers in spring and summer over green foliage. It is a clump form which blooms for a long time. Its flowers are among the showiest of the Tiarellas. PRN Preferred: The pinkest flowers on any Tiarellas we grow. 'Timbuktu' Foamflower is a mounding form with very dissected foliage of lustrous green, set off by purplish maroon center veins. 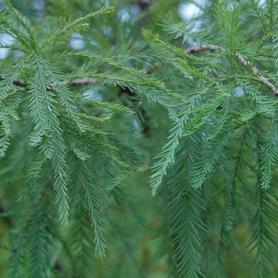 The leaves are attractive for almost all year, with greater color intensity as the temperatures cool in the fall. 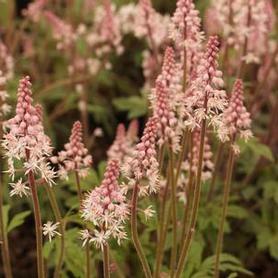 Tiarella x 'Timbuktu' is topped by lovely delicate pale pink to white flower spikes in mid to late spring. This is a great plant to combine in shade garden containers. 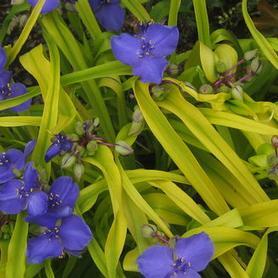 'Sweet Kate' Spiderwort has cobalt blue flowers starting in June and continuing almost all summer over yellow-gold foliage. This Tradescantia is still showy in our garden even in October. Does best in shade and likes moist conditions. 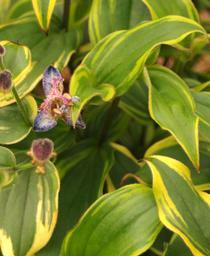 'Gilt Edge' Toad Lily has similar flowers to T. 'Samurai', but the foliage is distinctive with creamy yellow borders on the green leaves. The exotic orchid like blooms are pink and white with large purple spots and are produced from late summer to early fall along the stems. Tricyrtis formosana 'Gilt Edge' performs best in average to moist shade, expanding to form a wide showy patch. A Terra Nova introduction. 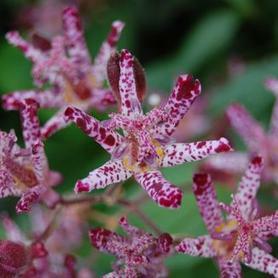 'Sinonome' Toadlily has white flowers in the fall which are speckled with purple. Tricyrtis x 'Sinonome' forms a good sized showy colony in time. The blooms cover the stems for a long period. Our son Carl Hesselein says it is his favorite fall perennial after seeing it in full bloom in October.